"Ejército de Liberación Nacional" redirects here. For other uses, see Ejército de Liberación Nacional (disambiguation). The National Liberation Army (Spanish: Ejército de Liberación Nacional, ELN) is a revolutionary left-wing armed group involved in the continuing Colombian armed conflict, which has existed in Colombia since 1964. The ELN advocate a composite communist ideology of Marxism and liberation theology. In 2013, it was estimated that the ELN forces consisted of between 1,380 and 3,000 guerrillas. According to former ELN national directorate member Felipe Torres, one fifth of ELN supporters have taken up arms. The ELN has been classified as a terrorist organization by the governments of Colombia, Peru, United States, Canada and the European Union. Especially in the departments of Arauca, Cauca, Choco, Norte de Santander and Nariño. Bajo Cauca Antioquia. Venezuela. The National Liberation Army of Colombia (Ejército de Liberación Nacional, ELN) was founded in 1964, by Fabio Vásquez Castaño and other Colombian rebels trained in Cuba; upon the Vásquez Castaño death, the ELN was headed by a series of Roman Catholic priests, exponents of Liberation Theology. 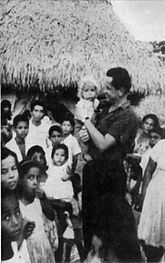 Most notable was the Priest Camilo Torres Restrepo (1929–66), a well-known university professor (egalitarian and Marxist) who was openly critical of the what he considered grossly unequal income among the social classes of Colombia. His attraction to the radical ideas of Liberation Theology led him to join the ELN, a guerrilla army intent upon effecting the revolutionary praxis of liberation theology among the poor people of Colombia. Father Camilo was killed in his first combat as an ELN guerrilla, and so became the exemplar ELN soldier, to be emulated by ELN guerrillas and by other liberation-theology priests from the lower ranks of the Roman Catholic priesthood. In the 1970s, after suffering military defeat and internal crises, the ELN was commanded by the Spanish priest Father Manuel Pérez Martínez (1943–98) alias El Cura Pérez (The Priest Pérez), who shared joint-leadership with leader Nicolás Rodríguez Bautista, alias "Gabino". From the late 1970s, The Priest Pérez presided over the National Liberation Army as one of its most recognized figures, until he died of hepatitis B in 1998. Father Manuel Pérez was instrumental to establishing the ideology of the ELN, a composite of Cuban revolutionary theory and liberation theology that proposes the establishment in Colombia of a Christian and communist regime to resolve the socioeconomic problems of chronic political corruption, poverty and the political exclusion of most Colombians from the government of their country. The ELN guerrillas survived the heavy fighting in the Colombian Army's Operation Anorí (1973–74), and then reconstituted their forces, with partial assistance from the Colombian Government of President Alfonso López Michelsen (1974–78), who allowed the ELN to break from and escape encirclement by the Colombian National Army. President López Michelsen helped the ELN in the hope of initiating peace negotiations with them in order to end the civil war. After this, the National Liberation Army of Colombia resumed financing its military operations by means of kidnap for ransom and the extortion of money from Colombian and foreign petroleum companies and by taxation of the private Illegal drug trade of Colombia. The ELN did not participate in the peace negotiations conducted between the Colombian government of President Andrés Pastrana Arango (1998–2002) and the FARC, yet did participate in an exploratory conference about possibly participating in peace negotiations. A Colombian government initiative towards granting the ELN a demilitarized zone in the southern region of the Bolívar Department was thwarted by right-wing political pressure from the United Self-Defense Forces of Colombia (AUC) whose paramilitary mercenaries conduct anti-guerrilla operations in that part of the Bolívar Department. The U.S. State Department has listed the ELN as a Foreign Terrorist Organization, ostensibly because of its reputation for ransom kidnappings and armed attacks on Colombia's infrastructure. In April 2004, the European Union added the ELN to its list of terrorist organizations for those actions and its breaches of humanitarian law. The ELN has also occasionally operated with the FARC-EP and like FARC it has targeted civilians, according to a February 2005 report by the United Nations High Commissioner for Human Rights: "During 2004, the FARC-EP and the ELN carried out a series of attacks against the civilian population, including several massacres of civilians and kidnappings by the FARC-EP. There were occasional joint actions by the FARC-EP and the ELN." In mid-2006, mutual rivalries between local FARC and ELN forces escalated into hostilities in Arauca, along the border with Venezuela. According to the BBC, "the FARC have for some years moved to take over ELN territory near the Venezuelan border, and the smaller rebel army reacted by killing several FARC militants". A statement posted on FARC's homepage accused the ELN of "attacks that we only expected from the enemy". The ELN's main source of income are businesses and middle class civilians in its areas of operation. To enforce these "taxes", they frequently take civilians captive to use as leverage. While the ELN uses the terms "war taxes" and "retentions" for these actions, critics insist they constitute "extortion" and "kidnapping". According to Claudia Calle, spokesperson for País Libre, a Colombian foundation for victims of abductions, the ELN is responsible for the death of 153 hostages between 2000 and 2007. According to País Libre, ELN abducted over 3,000 people between 2000 and 2007 and currently still holds 240 people captive. On December 7, 2008 18 ELN guerillas surrendered to the Colombian army in the northwestern province of Chocó. Protest march against ELN kidnapping: "So, what about the [people] kidnapped by the ELN?" Previous contacts continued during the early days of the Álvaro Uribe Vélez government but eventually were severed, neither party being fully trusting of the other. Only in mid-2004 the ELN and the government began to make a series of moves that, with the announced mediation of the Vicente Fox government of Mexico, lead to another round of exploratory talks. On July 24, 2004 the ELN apparently abducted Misael Vacca Ramírez, the Roman Catholic Bishop of Yopal, though their reasons were not clarified. The kidnappers said that Ramírez would be released with a message, but "Francisco Galán", a senior jailed ELN commander who has often acted as an intermediary between the government and the ELN's high command, said he did not know whether the group was responsible. The Bishop was subsequently released by ELN members, in good health, on July 27, after his kidnapping had been condemned by Amnesty International and Pope John Paul II, among others. As far as is publicly known, he did not have any message to announce on behalf of the ELN. Eventually, the ELN questioned Mexico's participation in the talks, arguing that it did not have confidence in the actions of a government which voted against Fidel Castro's Cuba during a United Nations vote. This led the Mexican government to end its participation. In December 2005, the ELN and the Colombian government began a new round of exploratory talks in Havana, Cuba, with the presence of the ELN's military commander "Antonio García", as well as "Francisco Galán" and "Ramiro Vargas". This was considered the direct result of three months of previous consultations with representatives of different sectors of public society through the figure of a "House of Peace" ("Casa de Paz" in Spanish). Representatives from Norway, Spain and Switzerland joined both parties at the talks as observers. During the February talks, which moved at a slow pace, the government decided to formally suspend capture orders for "Antonio García" and "Ramiro Vargas", recognizing them as negotiators and, implicitly, as political actors. The move was also joined by the creation of what was termed an alternative and complementary mechanism that could be used to deal with difficult issues and matters that concerned both parties, outside the main negotiating table. A formal negotiation process has yet to begin. On March 23, the ELN freed a Colombian soldier that it had kidnapped on February 25, delivering him to the International Committee of the Red Cross, saying that it was a unilateral sign of good will. The ELN's "Antonio García" expected to visit Cuba from April 17 to April 28, participating in different meetings with representatives of several political, economic and social sectors. The third round of the exploratory talks would have originally taken place in La Habana, Cuba from May 2 to May 12. The third round of talks was later moved to take place from April 25 to April 28. Both parties reiterated their respect for the content and spirit of all previous agreements, and that they would continue working towards the design of a future peace process. The Colombian government and the ELN intend to study documents previously elaborated during the "House of Peace" stage, as well as documents from other participants and observers. Both parties expected to meet again after Colombia's May 28 presidential elections. On August 30, 2007 the ELN said that in the statement the dialogues in Havana ended without agreement because of "two different conceptions of peace and methods to get to it". Colombian President Álvaro Uribe invited ELN Spokesman Francisco Galán for new talks about peace on April 3, 2008. The two spoke in the presidential palace. After the meeting Galán says the ELN will return to the negotiation table. The ELN released a press note shortly after that saying the rebel group "does not share the views" of Galán and dismissed him as their spokesman. The Marxist rebels did say they will continue to let Galán negotiate between the Colombian government and the rebels. On September 4, 2017, the ELN and President Juan Manuel Santos of Colombia announced a truce to begin on October 1 and to last at least until January 12, 2018. From May 25 to May 29 the group had a ceasefire in order to allow for "favourable conditions" during the 2018 Colombian Presidential Election. The ELN said it hoped "that this spirit of conciliation of the ELN is answered with a similar behaviour" from the government. On 17 January 2019, the ELN performed a car bombing at the General Santander National Police Academy in Bogotá, Colombia. The truck detonated and killed 21 people, including the perpetrator, and injured 68 others. It was the deadliest attack on the Colombian capital since the 2003 El Nogal Club bombing and the first attack on the capital since the 2017 Centro Andino bombing. The ELN accepted responsibility for the attack and justified it as a response to the bombings made by the Colombian government during the unilateral ceasefire. As a result of the bombing, President Iván Duque Márquez announced on 18 January that peace dialogue between the Government of Colombia and the ELN was officially suspended. Duque also demanded that Cuba extradite the ten ELN leaders that found refuge on the island nation during peace talks and the reactivation of their Interpol Red Notices, and he criticized Venezuela for providing refuge for the ELN on the Colombia-Venezuela border. In response to the request, Cuba's Foreign Minister announced that Cuba would abide by the protocols of ongoing negotiations between both parties. The Redes Foundation denounced in the Colombian Public Ministry that armed groups made up of National Liberation Army members and FARC dissidents, supported by the Bolivarian National Police and FAES officials, murdered two Venezuelan protesters, Eduardo José Marrero and Luigi Ángel Guerrero, during a protest in the frontier city of San Cristóbal, on Táchira state. Other protesters were injured during the shooting. 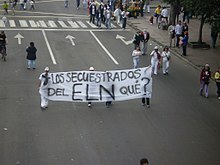 On May 26, 2008 the ELN wrote a letter to the FARC secretariat, seeking cooperation with Colombia's largest rebel group to overcome "the difficulties we are experiencing in today's Colombian insurgent movement". The letter was published on the ELN website. On 27 June 2017, FARC ceased to be an armed group, disarming itself and handing over its weapons to the United Nations. According to InSight Crime, the ELN and FARC dissidents allegedly met together in Venezuela to form a potential alliance in October 2018. Sources based in the Arauca department in Colombia provided the information, with reports that the groups would participate in illicit activity together. It was also alleged that former FARC commander Iván Márquez participated in the talks with the ELN. Since the 1990s, the ELN began to establish positions in the western border states of Venezuela. The ELN grew close to Venezuelan officials during the tenure of Venezuelan president Hugo Chávez, with Chávez approving relationships with the group. InSight Crime also states that Venezuelan president Nicolás Maduro was tolerant of the ELN, explaining that "ELN’s expansion in Venezuela has been marked by the Maduro administration’s inaction and even encouragement towards the group"; according to the group, the ELN operates in at least 12 of the 23 states of Venezuela. The Venezuelan NGO Fundación Redes has reported that the Venezuelan military had possibly armed ELN members. In 2019, ELN supported Maduro during the 2019 Venezuelan presidential crisis and said they "will fight" US troops if they invade Venezuela. The ELN has received support from the Tupamaro movement in Venezuela, a Venezuelan colectivo and political party. The Tupamaro movement supported the ELN's dialogue with the Colombian government, stating, "The Tupamaro Revolutionary Movement, now more than ever, stands in solidarity with this sister organization in the historic struggle against the neo-Granadian oligarchy and Yankee imperialism. We strongly ratify all of our support for the guerrillas and the ELN High Command, in the process that is developed with the participation of the Colombian people in the resolution of the armed conflict and the construction of peace with social justice". ^ "Estos son los departamentos donde hace presencia el Eln". eltiempo.com. Retrieved 30 January 2018. ^ "Fleeing Crisis, Some Venezuelans Are Recruited By Rebel Forces Fighting In Colombia". wunc.org. 18 January 2019. ^ a b "Colombia's ELN rebels release oil workers after brief capture -police". Reuters. October 18, 2013. ^ a b "Desmovilización, principal arma contra las guerrillas" (in Spanish). eltiempo.com. Retrieved 27 September 2013. ^ a b "Colombia army claims guerrillas have lost 5000 fighters in past 2 years". colombiareports.co. Retrieved 27 September 2013. ^ "Fear of missing out". The Economist. Retrieved 19 May 2018. ^ "Foreign Terrorist Organizations". Retrieved 28 January 2018. ^ "Currently listed entities". Retrieved 28 January 2018. ^ "GROUPS AND ENTITIES". Retrieved 28 January 2018. ^ "153 hostages died in the hands of the ELN". 11 July 2008. Retrieved September 2, 2008. ^ "ELN hostages are forgotten about, says País Libre". 27 June 2008. Retrieved September 2, 2008. ^ User Name: Adriaan Alsema (2008-12-08). "18 ELN guerrillas surrender – Colombia News". Colombia Reports. Retrieved 2013-04-28. ^ "Uribe meets ELN to discuss continuation of peace talks". Colombia Reports. April 3, 2008. Archived from the original on April 15, 2008. Retrieved 2008-04-03. ^ "ELN wants to negotiate peace with Colombian government". Colombia Reports. April 3, 2008. Retrieved 2008-04-03. ^ "ELN sacks spokesman after talking to Uribe". Colombia Reports. April 7, 2008. Retrieved 2008-07-03. ^ "Colombian government and ELN rebels agree ceasefire". BBC News. September 4, 2017. Retrieved September 4, 2017. ^ "Las pistas sobre el ataque con carro bomba a Escuela de la Policía". El Tiempo. 17 January 2019. Retrieved 18 January 2019. ^ Radio, AFP, Caracol (17 January 2019). "Esto fue lo que sucedió y cómo entró la camioneta a Escuela de la Policía". Caracol Radio. Retrieved 17 January 2019. ^ "Doloroso balance terrorista en BogotÃ¡". KienyKe. 2019-01-18. Retrieved 2019-01-18. ^ "ELN claims responsibility for Bogota car bomb that killed 20 at a police academy". CNN. 21 January 2019. ^ "Duque clausura diálogo con ELN en Cuba y lanza advertencia al gobierno de Venezuela (Video)". La Patilla (in Spanish). 2019-01-18. Retrieved 2019-01-19. ^ "The Latest: Colombia's president reactivates arrest orders". Seymour Tribune. 18 January 2019. Retrieved 2019-01-19. ^ "Colombia asks Cuba to extradite ELN rebels after bombing kills 21". Aljazeera English. 20 January 2019. Retrieved 2019-01-20. ^ "Denuncian que guerrillas colombianas causaron muerte a venezolanos durante manifestaciones contra Maduro". Infobae (in Spanish). 25 January 2019. Retrieved 28 January 2019. ^ "Open letter to the FARC secretariat". ELN. May 26, 2008. Archived from the original on 2008-06-06. ^ Kirby, Shannon (2018-12-10). "FARC Dissidents and the ELN Turn Venezuela Into Criminal Enclave". InSight Crime. Retrieved 2019-01-22. ^ a b Venezuela: A Mafia State?. Medellín, Colombia: InSight Crime. 2018. p. 18. But Colombia was not content with simply exporting cocaine to Venezuela. By the 1990s, it was also exporting its civil conflict, with the rebel armies of the Revolutionary Armed Forces of Colombia (Fuerzas Armadas Revolucionarias de Colombia - FARC) and the National Liberation Army (Ejército de Liberación Nacional - ELN) taking up residence in Venezuela’s border states. Both groups have long been involved in the drug trade and developed close links with Venezuelan officials, often with the blessing of President Hugo Chávez. ^ "Colombia: Evidence suggests Chávez gave FARC $300M". CNN. 2008-03-03. Archived from the original on 2008-03-09. Retrieved 2008-03-03. ^ "El ELN opera en 12 estados de Venezuela". InSight Crime. 13 November 2018. Retrieved 3 January 2019. ^ Kirby, Shannon (2018-11-13). "ELN Now Present in Half of Venezuela". InSight Crime. Retrieved 2019-01-22. ^ Charles, Mathew (2 February 2019). "ELN interview: Colombian Marxist guerrillas 'will fight' US troops if they invade Venezuela". The Telegraph. Retrieved 2 February 2019.